Lester Parson is played by Brett Halsey. He has a gambling addiction and worse still he is no good at it. Lester is informed that he could not pick a winner in a one horse race even if it was fixed. He courts and kills rich widows to fund his habit. 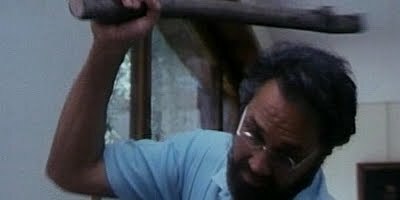 With many of the gore sequences appearing in Cat In The Brain Lucio Fulci's black hearted and misogynist horror comedy will seem familiar to those who have seen the Godfather Of Gore's giallo clipshow. A Shocking and brutally realistic chainsaw dismemberment is a particular highlight and a mystic hippy is repeatedly run over in a Mercedes. Much of the humour actually works pretty well and this may leave the viewer with a certain sense of unease as gags revolve around some pretty brutal killings as the camera dwells on the imperfections of the female protagonists providing a glimpse of the workings of the mind of a deranged serial killer as he goes about his humdrum daily existence. Zora Kerova is in this and Rabid Dogs star Maurice Poli has a minor uncredited role as a newsreader.